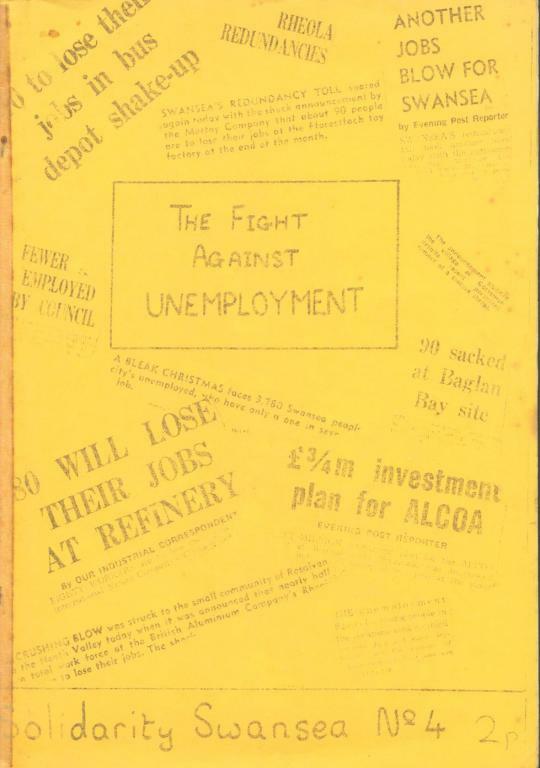 'The Fight Against Unemployment' was Solidarity (Swansea) Pamphlet No. 4. It's undated but a report of the Swansea group's activity at the Solidarity national conference in November 1971 stated that they were in the process of producing it. This list shows how bad the Swansea/Neath area has been hit by redundancies in the last nine months. The pamphlet looks at the total lack of any effective opposition to the sackings, the reasons for it and also suggests how the situation can be altered. Besides the publicly announced redundancies most other factories and plants in the area have been quietly implementing labour "phasing out" plans. Yet in opposition to all this the only action taken has been a one-day strike at Aladdin Ltd., Pontardawe at the end of last month. Apart from making the usual regulation noises the record of the unions has been one of abject failure. Indeed, union officials have spent much time in praising the attractiveness of redundancy terms to the exclusion of explaining what a 'con-trick' these are in practice. "Big Wage Claims Cause Rising Prices" — If you agree with this then logically you have to stop making wage claims — that's just what the bosses and Tories want, a voluntary wage freeze that will give them time to build up profits again. When the Tories came to power they had to deal with inflation — a situation of constantly rising prices caused by business passing on to you higher costs of producing goods (caused by rising costs of imported raw materials, replacing machinery, rising taxes etc.) and taking every opportunity to boost its profit margins (rounding up at decimalisation, taking advantage of wage rises to slap on big price increases etc.). THE RESULT BECOMES THE CAUSE !! Yet prices still rise faster than real wages (⅓ of a rise is taken in tax) so that workers, such as postmen, are accepting a cut in their standard of living through accepting their miserable 'rise'. "High Wages Cause Unemployment" — More Lies. Because their profits are feeling the pinch bosses decide to 'rationalise' production — this means withdrawal from less profitable areas such as South Wales. One of the reasons given for this is that they can't sell their goods. But low wages, dole and social security money mean workers can't spend much anyway — so demand for goods falls — the bosses worry about their profits again and push more people out of work. So low wages, not high wages, would explain the growing unemployment ! More 'Goebbels' type lies from the Tories. At the same time the employers are cynically sacking thousands of men now that they have the chance in order to make huge financial benefits. For a number of years Big Business has been falling over itself to obtain 'government free interest investment and development grants', 1 factory premises and equipment sold at ridiculously low prices by the government. All these measures were designed to build up projects that would supposedly provide hundreds of jobs in areas of high unemployment. But having got hold of their public money Big Business is now equally rapidly falling over itself to lay men off at factories which have, to a large extent, been subsidised by public money — any old excuse will do. The Tories know that the way they attacked inflation would increase unemployment to about a million; end considering the industrial depression it would bring, not knowing how long it would take to bring it down again, and the possible political implications, they must have had good reason for letting unemployment grow to the level it has. They did. Useful Weapon — Unemployment is a useful weapon to the bosses — when unemployment is low the workers hold the best cards and can use their strength to fight for better wages and conditions. So unemployment is a stick to threaten the workers with, making them accept poor wages and conditions, and forcing those on the dole to take the most poorly paid jobs. Now also the full implications of the unions acceptance of large scale productivity bargaining over the last ten years are beginning to be realised. It may seem to a large extent a luxury to expect people to consider the importance of productivity deals at a time when one million workers are out of work. It is important, however, to see productivity deals as part of a multiple offensive against the working class of which unemployment is the most striking example, and also to see productivity deals as a cause and effect of unemployment. The philosophy of government and industry over the last ten years has been to convince ordinary working people that they have a common interest with the bosses in promoting industrial efficiency and the national interest. The press and television have campaigned relentlessly for workers to accept that they should only get pay increases when they can prove that they will double the bosses profits. The trade union bureaucracy has dived headlong for the idea of productivity bargaining to ensure their control and the bosses profits. The state has used the Incomes Policy to ensure the same thing and has produced the Industrial Relations Bill not to discipline the union leadership whose objective is the same but to discipline the rank and file organisations of workers led by shop stewards who have been the only obstacle against the total acceptance of this offensive. The working class is now being shown what the acceptance of the bosses, and the national interest means to them — one million unemployed and rampant inflation. Productivity deals weaken the power of the working class in its struggle with the bosses. These deals and the bonus systems that go hand in hand with them have the effect of creating false divisions between workers in different parts of a factory, which can be played upon by the management to smash solidarity amongst the work force. Similarly, different factories owned by the same company can be divided by pushing through productivity deals in one whilst delaying them in another, this nullifies claims for parity of wages end lessens the chance of solidarity between the two work forces against their common enemy. British Aluminium Company provide an example in the use of this tactic in the Swansea area where they allowed great variations in wages for the same job between their Rheola and AWCO works on the grounds that they were at varying stages of productivity. Productivity deals also weaken the strength of the working class because they make it increasingly difficult for wage increases to come about without great increases in the amount of work forced out of people. In fact they mean a progressive deterioration in the conditions of work for even smaller pay rises. The union leadership has been willing to accept this situation since it is easy initially to get large pay rises for their members and it strengthens their hand against rank-and-file pressure since interest in productivity deals is a commitment to negotiation and procedure, excluding industrial action and claims. The situation of high unemployment can to some extent be attributed to the wave of productivity deals that have hit British industry. Consider the nature of unemployment both locally and nationally. A large proportion of the unemployed are those who have never been allowed to take a job — school-leavers. Once a productivity deal comes into effect there is no need to take on extra people to increase production the bosses just move on to the next stage of the deal. This leads to a severe limitation on the job opportunities for school-leavers. A large part of the present unemployment then can be attributed, after the necessary time lag, to the great amount of productivity deals signed in the mid 60's. Many redundancies too can be blamed on productivity deals. Productivity deals are geared to expanding markets and expanding production. Production is increased not by additions to the work force but increases in the amount of work got out of the existing work force. The number of people needed to produce a certain level of output is constantly being reduced, therefore even if production remains stable there are bound to be redundancies. This effect is magnified with successive cutbacks in production. Of great importance for the present situation is the fact that markets have not been expanding for a long time at the rate that production and the productivity of the workers have been. This has led to a large amount of stockpiling. Therefore even if demand at the moment has not fallen significantly the bosses can get along with a reduced production and sell off their surplus stocks. Again the working people are being penalised for the inefficiency of the bosses. It is in the interest of the rank-and-file workers to resist all attempts at introducing productivity deals into their factories. Yet it is precisely at times of unemployment and insecurity that the employers con push through even more vicious productivity deals. The union leadership will help in this onslaught — only concerted and consistent resistance from the rank-and-file can ensure the right of wage increases without progressive reductions in the standard of working conditions. We've looked at the role of the unions in foisting productivity deals on their members, now we must have a closer look at the T.U.C. 's 'fight' (if doing bugger-all can be called a fight) against the Tory policies. "At least when the Tories are in we know where our class enemy is. We expect doses of unemployment from a party that makes no pretence at putting profits before the welfare of those who create those profits." And what? Put another Labour government in? This is exactly what the T.U.C. is advocating : they want to return Wilson, Castle and Co. to power — the instigators of the "shake out" policy in industry with its 'tolerable' level of unemployment which their successors have failed to control. The fact is so far as the-working class is concerned there has been unbroken Tory rule since Disraeli. And to the extent that the T.U.C. are solely concerned with returning the Wilson version of the Tory party, it reveals their lack of common interest with the workers. Neither the T.U.C. nor the Labour Party are on our side. 3 There are two main reasons why the T.U.C. 's policy is no more then an election campaign for the Labour Party. In the first case it is a matter of self-interest. Knighthoods, lucrative jobs on the boards of nationalised industries, and graft in general are available to T.U. officials in return for keeping the peace in industry. In other words, keeping you tied to your miserable factory bench until such time as the boss feels like giving you the sack. The second reason concerns the nature of the T.U.C. : it is and always will be a bureaucratic institution. Its purpose is to act as a lubricant for an industrial society. It is the peacemaker, keeping the wheels running smoothly with instant compromise's, productivity deals and sell-outs. Consider the form of opposition to unemployment that the T.U.C. has taken. Apart from Feather's empty rhetoric, what have they done? What action have they taken against firms carrying out mass redundancies? What about a demand for work-sharing, or encouraging workers to run their own factories? True to form the T.U.C. have run to Heath, just as he knew they would, and offered to hold back wages as a gesture! This is the only plan they can think of: remember Woodcock's contribution to Brother George's national plan? Yes, they promised to hold back wage demands with the 'Incomes Policy', 'In Place of Strife' etc. If a flu epidemic breaks out this winter you can guarantee that the T.U.C. will offer to hold back wage claims until the virus goes away. But by now it is clear that workers are seeing through the emptiness of the T.U.C. 's rhetoric. Heath and Wilson won't be able to rely on Feather and Co. to soften the demands of militants. The November 24th demo revealed a new anger, an anger that will not be quenched with a Labour majority, still less with the meaningless cap-in-hand approach of the T.U.C. The working class no longer expects the T.U.C. to fight for them — the T.U.C. must be fought. The working class can now rely on no-one but itself to fight its battles. It is now necessary to look at the way in which those battles can be fought. The most important aspect of an occupation (also the most obvious) is that the workers have control over the factory! Unlike a strike, where the usual practise is to go home, watch its progress on T. V. (and leave the final settlement to the T.U. lenders), in an occupation all workers play an equal part. The factory itself becomes the focal point of the struggle rather than the offices of the national committee of the union or the corridors of Whitehall. The solidarity of the work force is increased through everyone being together. Decisions ore reached in a true democratic fashion with everyone involved. The bosses are forced to come to the workers to negotiate). Other obvious advantages are that it eliminates blacklegging and scab labour; also it is impossible for the boss to bring goods in or move any equipment out. The story of the work-in at U.C.S. has been well documented and therefore we won't go over old ground again. The occupation at Plesseys has received much loss publicity (perhaps because of the nature of the takeover!). The factory in Alexandria, near Dumbarton, was formerly government owned end was used for the manufacture of torpedoes. It was announced in January 1970 that the factory was to close throwing 1,200 out of work in an area that already had a male unemployment rate of 11%. In an attempt to bring jobs to the area Plesseys were allowed to purchase the factory for the ridiculously cheap price of £650,000, when at a conservative estimate the building and machinery wore worth £5,0110,000! At the time of the purchase Plesseys announced that there would be jobs for 2,000. In fact the labour force has never been more than 750 and by May of this year the company announced that the factory would hove to close. This would have meant that Plesseys would have raked in a nice profit from the sale of the buildings and machinery, some of which they planned to move to their other factories in England ! However, in September when the remaining 250 workers were sacked they physically took over the factory and have been in occupation ever since. The plan of Plesseys to buy the factory cheaply from the government, on the premise of a few thousand jobs for the area, and then to sell it off at a profit has failed. There is no doubt that at Plesseys the workers are firmly in control. The men control the gates — no-one can get in without their say so. The buildings and machinery have proved a level against the bosses — so much so that Plesseys have now stated that they would be prepared to sell the factory for £650,000 — the price they paid for it. At U.C.S. the position is much less clear. The work-in seems to be totally controlled by the shop stewards who seem intent on maintaining good relations with the management, police, etc.. There is no take-over of the yards, the management come and go as they please. The men all go home at the weekends. Ships are still being built — surely the aim of the Work-in is NOT to allow the liquidator to wind up the yards easily! Also a report appeared in the Daily Record (the Scottish Equivalent of the Mirror), 12.11.71, stating that the unions were prepared to guarantee no industrial action on future orders placed at U.C.S. This, of course, was firmly applauded by the paper. No doubt the government are delighted at this chance to remove any industrial action from the yards. Is this the best way to fight redundancy? With unemployment reaching the million mark the time has come for discussion of types of action that workers can take to fight back. Greater communication between workers is needed — more industrial action based on the local situation and not some outdated stereotype is needed. Solidarity action by workers in other factories in the same area and other workers employed by the same company all over the country are necessary backing for a successful occupation. Yet often the unions do their utmost to prevent such action let alone encourage it. Similarly with a million out of work there should be no overtime worked anywhere. Yet millions of workers are still working huge amounts of overtime which helps to throw thousands of others an the dole. 5 With certain exceptions, locally the Llanelli District Committee of the AUEW has banned all overtime in its area, again the unions have done bugger all. In all these respects, occupations, solidarity action, overtime bans, the rank-and-file must seize the initiative or nothing at all will be done. As we have seen the best way to fight unemployment is to take action before you get the sack so that it never happens. But this said, it is vitally important that the unemployed do form themselves into effective fighting organisations rather than becoming mere bystanders in the struggle against the Tories onslaught on the working class. Although many T.U. leaders pay lip service to the idea of creating active sections of the unions for unemployed members, in practice no such thing has happened or indeed will happen. The unemployed have therefore had to form their own rank-and-file organisations. The Claimants Unions which have sprung up all over the country are a result of this. In fighting to establish people's rights, to make sure that people on U.B. and S.B. get the money they should, the C.U. 's are performing a necessary and vital function. However it is essential that the struggle goes beyond this stage to actively attack the system that has thrown one million out of work. In the 1930's the N.U.W.M. occupied labour exchanges, public buildings, and factories which were operating large scale overtime. Demonstrations were held inside the Savoy and other haunts of the rich. The use of such direct action techniques has a potential which has not yet been realised. In recent months there have been short isolated sit-ins at S.S. offices and these are a step in the right direction. With local Trades Councils and the Unions having opted out of organising even demonstrations versus unemployment in the Swansea area it is up to those who are out of work themselves to seize the initiative now, and begin a series of militant demos end action. Socialism is not transistors for the prisoners, it is the abolition of the prison. The best we can expect is a gentle fall in unemployment during 1972, yet the indications show that things are going to grow worse. 6 Against this background the Labour Party and the Trade Unions are proving themselves completely incapable of any effective struggle — indeed they have contributed as much as the Tories to the creation of the present situation. Later, if successful, we will be back in the same position — same bosses, same orders given and same orders taken, same boot licking, forelock tugging. Work again is still the dominant factor in our life; its boredom and absurdity effects the whole of our life — outside work as well. We will have won the right to continue being exploited by the bosses. 8 We must relate our struggles over wages, conditions and job security as well as job control with the struggle for a society in which work is not dehumanising and stifling, where satisfaction, creativity and fulfilment have some meaning. A society in which our environment (all aspects) is directly under our control (not controlled from without) is our aim. We must fight to protect what we hove already gained from past struggles, but we must also take the offensive, challenge the 'rights' and privileges of those who run our lives for their own ends. Occupations and the democratic management of struggles challenge the bosses 'right' to own and control 'their' factories and creates a solidarity and realisation of common interests that can become a powerful weapon. We learn that the bosses are parasites, living off our labour and who, with united working class action can be discarded. We can (and do) run the factories without them. We con build a society where we have full control over our work and our lives. This pamphlet has been produced by Solidarity Swansea. Solidarity Swansea, c/o 16 Heatherside Close, Oystermouth, SWANSEA. All obtainable from the above address. 1. British Aluminium is just such a company. In this area it has declared redundancies at AWCO and Rheola having had much public money to establish its factories in the first place. British Aluminium is doing the same thing all over the country. 2. For one or the worst productivity deals ever look at the notorious Green Book agreement signed by the unions at Margam and Abbey Steelworks, Port Talbot. It covers everything down to tea and lavatory breaks and has cost over 2,000 jobs in the last five years. 3. The height of hypocrisy is Wedgewood Benn's apparent stand on the side of the U.C.S. It was he who engineered the Fairfields deal at the yards in 1966 with the loss of over 3,000 jobs. 4. For a closer look at the differences between the action at U.C.S. and Plesseys see the latest issue of 'Solidarity', N. London. 5. With the Post Office reorganisation proposals a cutback in staff numbers on the postal side is inevitable. Yet at the same time as apparently opposing such proposals the U.P.W. is quite happy to see its members working fantastic amounts of overtime. 6. Not that we think capitalism is reaching its final insurmountable economic crisis or that it ever might. The social system in the industrialised west has bred a continuous series of financial and economic crises. These crises need not lead inevitably to a total breakdown. The system has not stopped breeding them but it has coped with them. To say capitalism can resolve these particular problems is not to say that it can resolve the contradiction between the realisable productive capacity of modern industry and the limited market, necessarily limited because of the exploitative relationship with the rest of the world. But over-production has not, as yet, precipitated crisis and, in fact, this may never be realised as such. The American war economy is one way of squandering excess capacity. In Britain where such arms expenditure has rather caused under investment, the distribution of resources, and the inflationary growth of non-productive manpower, has achieved the same result. 7. For example the sit-in at J. Engl Ltd. Bridgend in November. Workers staged a sit-in in the factory, barricading the entrance in order to prevent removal of machinery for the purpose of obtaining holiday and bonus money owed to them when the firm suddenly closed down. After four days their aims were realised. 8. Full employment in itself is not a cure-for-all-life. In Hungary and Czechoslovakia where there is full employment the workers fight for real control of their society.